Image: Aerial view showing the current ring of the LHC (27km) and the proposed new 100 km tunnel that could host different colliders modes (FCC-ee, FCC-hh, FCC-he). Today (15 January 2019), the Future Circular Collider (FCC) collaboration, which involves University of Liverpool physiciists, submitted its Conceptual Design Report (CDR) for publication, a four-volume document that presents the different options for a large circular collider of the future, an electron-positron (ee) collider and a hadron-hadron (hh) collider with an integrated hadron-electron (he) collider. It showcases the physics opportunities offered by machines of unprecedented energy and intensity and describes the technical challenges, cost and schedule for realisation. In the forthcoming year, the particle physics community will be updating the European Strategy for Particle Physics, outlining the future directions of the discipline beyond the horizon of the Large Hadron Collider (LHC). The roadmap for the future, considered in a global context, should lead to crucial choices for research and developments in the upcoming years, ultimately with a view to building a particle accelerator complex that will succeed the LHC and expand significantly our knowledge of matter and the universe. The new CDR contributes to the European Strategy. 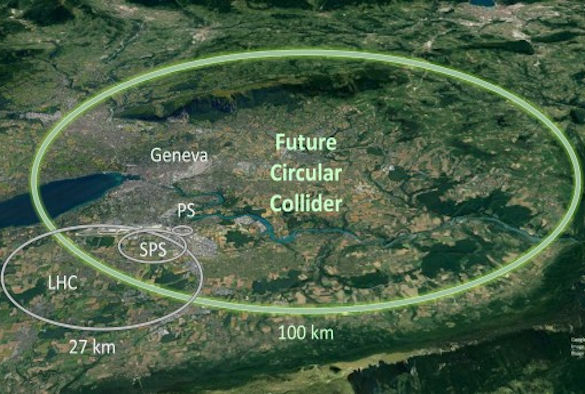 The opportunity for a future circular collider will be examined during the strategy process, together with the other post-LHC collider option at CERN, the CLIC linear collider. 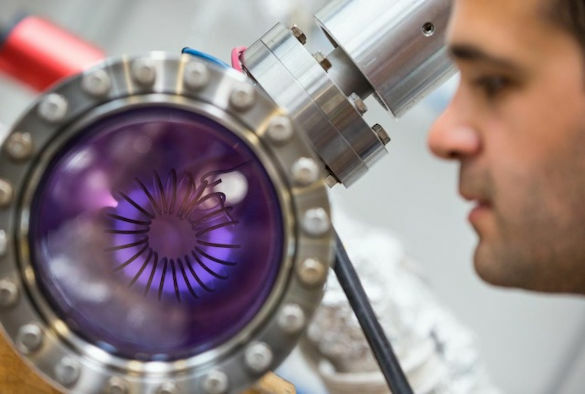 With the operation of the LHC foreseen towards the end of the thirties, the strategy deliberations will also consider an intermediate step proposal for adding an electron beam to the LHC in its final phase, the LHeC. The FCC study started in 2014 and directly stems from the previous update of the European Strategy approved in May 2013, recommending design and feasibility studies to be conducted for Europe “to be in a position to propose an ambitious post-LHC accelerator project at CERN by the time of the next Strategy update.” The FCC designs consider electron-positron, proton-proton and ion-ion collisions at unprecedented energies and intensities, with the possibility of electron-proton and electron-ion collisions. Researchers from the University of Liverpool’s physics department have leading roles in the design of the FCC and have been involved as well in the associated European Union-funded design study EuroCirCol. The discovery of the Higgs boson at the LHC opened a new path for research, as the Higgs boson could be a door into new physics. Detailed studies of the Higgs boson’s properties are therefore a priority for any future high-energy physics accelerator. The different options explored by the FCC study offer unique, synergetic opportunities to study the nature of the Higgs boson. In addition, experimental evidence requires physics beyond the Standard Model to account for observations such as dark matter. The search for new physics, for which a future circular collider would have a vast discovery potential, is of high importance to make progress in our understanding of the universe. Professor Max Klein, co-coordinator of the future hadron-electron colliders program, said: “The stunning success of elementary particles physics in the exploration of nature roots in its exemplary international collaboration and the development of generations of ee, hh and he colliders of ever increasing energy and intensity”. The FCC design study was realized as a global effort. Over five years and with the strong support of the European Commission through the Horizon 2020 programme, the FCC collaboration involved more than 1,300 contributors from 150 universities, research institutes and industrial partners who actively participated in the design and initial R&D efforts. The electron-positron collider would serve the worldwide physics community for 15 to 20 years and its physics program could start when the research program at the high-luminosity LHC would come to an end. To find out more about the FCC project, please have a look at the video FCC – Expanding our Horizons, produced by CERN and the University of Liverpool.